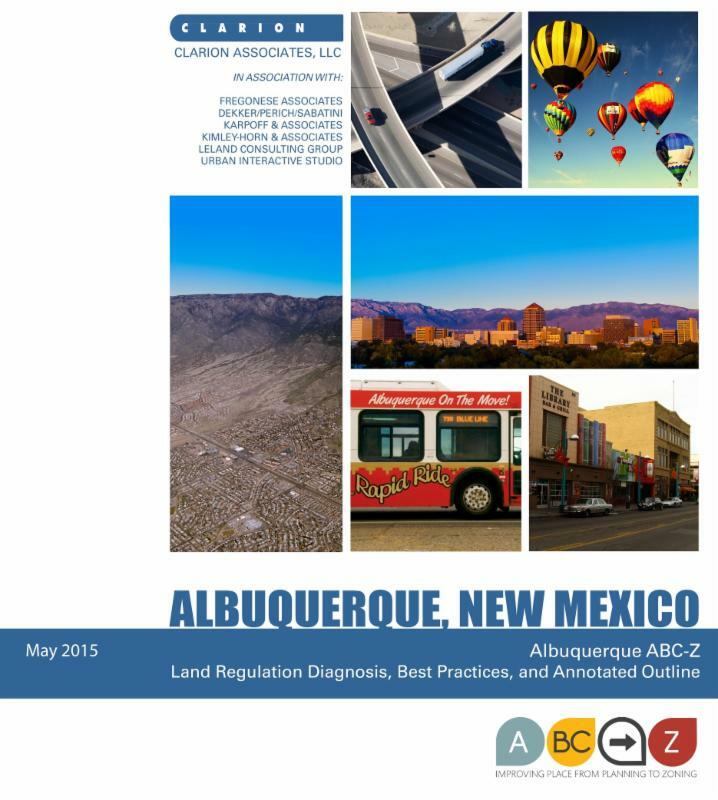 The City of Albuquerque and Bernalillo County have created ABC to Z – an ambitious, two-year project to update the Albuquerque/Bernalillo County Comprehensive Plan, and also to integrate and simplify the city’s zoning and subdivision regulations to implement the plan. ​Key goals of the project are to improve opportunities for economic development and job creation, improve protection for the city’s and county’s established neighborhoods and special places, streamline the city’s development review and approval procedures, and respond to long-standing water and traffic challenges by promoting more sustainable development. The involvement of Bernalillo County in the process will be limited to the update of the Albuquerque/Bernalillo County Comprehensive Plan. The City Planning Department has submitted an updated Comp Plan to the city's formal review and approval process. The plan goes first to the City of Albuquerque's Environmental Planning Commission (EPC) in August, then the City of Albuquerque City Council's Land Use, Planning, and Zoning Committee (LUPZ), likely in October, and then on to the full City Council for a vote to approve or deny, likely in November 2016. If the City Council adopts the Comp Plan updates, the draft will then be sent through Bernalillo County's formal review and approval process. The Environmental Planning Commission (EPC) will hold two study sessions to learn about proposed updates. These are listening opportunities only; public input will NOT be taken. The EPC will hold two public hearings to take public input and make a recommendation for approval or denial to City Council. You are encouraged to attend and give testimony. See the EPC draft document in its entirety here. Due to several requests, the deadline for public comments has been extended to Friday, March 11, 2016 to be considered for the draft submitted to the City's Environmental Planning Commission (EPC) on April 28 for a June 2 public hearing. The EPC June 2 public hearing will be the first step in the review and approval process, expected to take at least six months. We welcome public comments via letter, email, and in person at each stage. The earlier you get them in, the sooner we can consider them to improve the draft! Comments received by March 11 will be considered for the initial draft submitted on April 28 for a June 2 public hearing at EPC. Comments received by May 23 (10 days before the hearing) will be included in the public record and will be addressed in the staff report to EPC. Comments and testimony are considered throughout the review and approval process until a final vote by City Council and the County Commission. On the project webpage, where you can leave comments. Display copies at all ABC Libraries and City Community, Multi-generation, and Senior Centers. While we welcome general feedback, please be sure to point out to us what you like, as well as don't like, about the proposed update. It is also very useful to point to specific section numbers or policy numbers in your comments whenever possible. Thank you for your thoughtful review of the proposed Comp Plan update. The public draft should be seen as a snapshot in time, indicating progress to date – we appreciate your review and detailed comments to improve it. In the meantime, the project team will work on incorporating graphics, additional text and maps, and Appendix items. Following the Jan. 27 - 28 public meetings, the team will revise the draft again to reflect staff and public comments and prepare for a submittal to the review and approval process for the city in March, 2016. Please review the draft and provide comments by Feb. 11, 2016 via the project website or emails to abctoz@cabq.gov. Comments received after the deadline may not be reflected in the March 2016 submittal but will be taken into consideration for subsequent drafts. Comp Plan Draft Open Houses to share the full Comp Plan draft for public review and discussion. Footnotes indicate policies or actions incorporated from one of the City’s Rank 2 Area Plans or Rank 3 Sector Development Plans. Numbers in brackets refer to a row number in an associated spreadsheet of goals and policies, which can be found on the project website. Full Comp Plan (Warning: large file. May require significant download times). 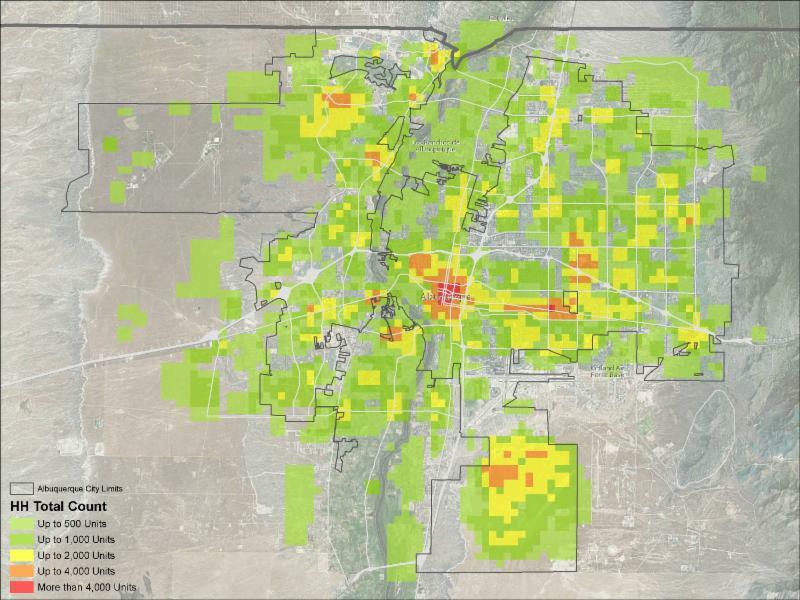 Project Update: Since February 2015, the City of Albuquerque and Bernalillo County have been working towards updating the Albuquerque/Bernalillo County Comprehensive Plan, which has been a jointly adopted planning document since the 1970s. A number of public meetings, including open houses and focus groups, have taken place to gather input to help formulate a community vision and to obtain ideas for the Comprehensive Plan update. In September, the project consultant, Fregonese Associates, presented the updated vision (available online at the project webpage) for the Comprehensive Plan. The vision is a summary – a preview of the plan with a map describing the pattern for future growth in our region and key issues and strategies for each comprehensive plan topic. Based on the existing comprehensive plan and the new vision, and input obtained thus far, staff and the consultant are now hard at work drafting the new chapters of the updated plan, which includes policies and strategic actions to move us toward the vision over the next 20 years. Additional public meetings (city and county): are scheduled beginning in late November and early December to familiarize the public with the Comprehensive Plan elements (topics/chapters) and to obtain additional input on those elements. Informational meetings that will focus specifically on the Comprehensive Plan Update for the county have also been scheduled in December. Additional public meetings will be held in January, 2016 to introduce the first draft of the plan. Meetings will be held at Plaza del Sol, Basement Hearing Room, 600 Second Street NW. Module 1 proposed new Zones and the Land Uses allowed in each (now available on the project webpage for review and comment). Learn More: For more information and to sign up for updates, please visit abc-zone.com or visit us on Facebook at facebook.com/abctozoning. 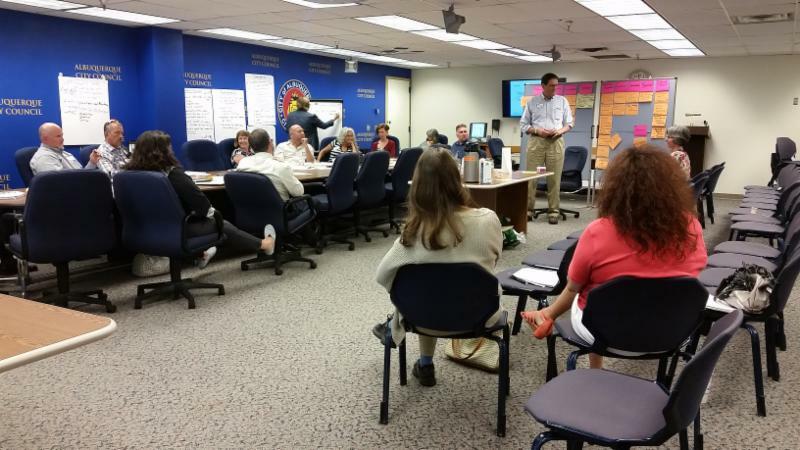 City and county staff, together with project consultants, have begun drafting the updated Albuquerque/Bernalillo County Comprehensive Plan that includes a new vision map for future land use in the city and county based on the existing plan and the input provided at community workshops and focus groups earlier this year. To view a draft of the vision map that is currently under review, click here. The Comprehensive Plan Vision Map and Plan Overview will be introduced at four upcoming community meetings. You may attend any of the meetings. Results of the May county-wide community workshops are up on the project website. Fregonese - the Comp Plan consultants - digitized each table's maps from the May workshops and analyzed them individually and collectively. These maps will help guide the revised community vision for the comprehensive plan. Instant polling at each workshop has been analyzed compared to the online survey in both English and Spanish. Results are posted here. Fregonese has also digitized all the comments mapped at the June quadrant workshops. These will be available as an interactive map on the project website soon. Huge thank you to over 350 staff and community members who attended one or more focus groups July 13 - 22. These working sessions provided important discussions on topics to be updated in the comprehensive plan. The consultant team is now drafting updates based on focus group input and workshop results. Look for the first installment of comprehensive plan revisions in September. The full draft is expected to be available for public review in November. Presentations and notes from each focus group are available on the project webpage here: http://abc-zone.com/documents. Clarion Associates - lead consultant on the "Z" (zoning) portion of ABC-Z project - is hard at work on Module 1. The first of three modules that will become the Integrated Development Ordinance, Module 1 will propose new zoning districts and the uses allowed in each. The module is expected to be released for public review in October. In the meantime, you can still get up to speed by reviewing Don Elliot's presentation of key items in the Zoning Diagnosis here. Or review the entire Zoning Diagnosis online. Please note that the integrated development ordinance is a process that only the City of Albuquerque is doing. Bernalillo County is only participating in the Comprehensive Plan update process. The next step in the Comprehensive Plan Update process is focus groups and general meetings to obtain specific input for the plan update, related to such areas as land use, transportation, the environment, public services, and housing. All of the meetings are open to the public. Please click on the images below for a downloadable, printable Community Workshop flier. Please click here to see the current Comprehensive Plan. Streamlines the city’s procedures for reviewing and approving new development. ABC to Z will include extensive outreach embracing community-wide participation of zoning code users, citizens, investors, interest groups, and other stakeholders. Numerous meetings, workshops, and public hearings will be held over the next two years. An initial project website has been created at abc-zone.com, which will include additional information, interactive outreach materials, and project documents in the months ahead. The project has started with a series of initial meetings with citizens, stakeholders, and zoning code users on February 4 - 6, 2015. The city has hired Clarion Associates, a nationally recognized planning and land-use firm, to lead the undertaking. The first step in ABC to Z is to listen to citizens, businesses, stakeholders, and land development administrators about what works, what doesn’t, and what could make Albuquerque an even greater city to live, work, play, and invest. The city, the county, and the consultant team will then move on to analyze data for the Comprehensive Plan update, and then the city and the consultant will prepare a roadmap and outline for recommended changes to city zoning and subdivision regulations. The remaining steps in this ambitious two-year schedule are summarized in the table below. The initial meetings and discussions took place among staff, agencies, and the public in February, 2015. More specific workshops are being planned for May 2015 related to the long-range planning for the region and the Comprehensive Plan. Visit the project web site, abc-zone.com, where you can review the project timeline, see upcoming meetings and workshops, review documents produced to date, and offer suggestions on how to make Albuquerque an even greater place to be. In the next few months, we will be offering interactive tools and links through this ABC to Z website.